Jonathan Stroud is the author of one of my favorite books, Ptolemy's Gate. I've had a copy of Stroud's book, Heroes of the Valley, on my To Be Read heap for a couple of years. I bought it at a yard sale from a professor who was selling hundreds of books. It was a beautiful October day. Ah, a lovely memory. Heroes of the Valley is not my favorite Stroud book. The story is slow getting started for my taste. The disturbance to main character Halli Sveinsson's world, and disturbances are what initiate plot, doesn't come for a while. I never got over that. The book has a couple of interesting aspects, though. First off, the basic setup involves a valley dotted with twelve houses/villages founded by twelve heroes. Their descendants are the lords of the manor, so to speak. The heroes lived in a rough and tumble time when creatures called Trows were a danger to the people of the valley and the heroes, including Halli's ancestor Swein, fought them. Okay, this sounds a little run-of-the-mill. The unique twist here is that the tales of Svein's exploits have just a bit of an undertone of ugliness. I like that. I am someone who finds the so-called hero Odysseus a bully and a nasty piece of work. Stroud's portrayal of Svein falls into that same kill-and-take-and-sing-my-praises vein. I also appreciated the fact that Halli Sveinsson and his sidekick/love interest Aud Ulfar's-daughter aren't particularly likeable people. They are put upon and hassled by other characters who are even less likable, but, still, our leads are not traditional, cookie cutter book people readers want to identify with. I get very tired of likable characters, personally. I am unable to identify with them, as a general rule. 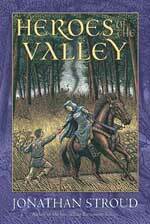 It was these dark aspects of Heroes of the Valley that kept me reading.